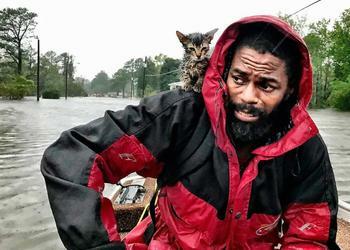 RALEIGH, North Carolina, September 17, 2018 (ENS) – The worst of Hurricane Florence’s historic rainfall will pass out of the Carolinas today, but devastating flash flooding and river flooding can prolong the disaster for another two weeks, weather forecasters warn. The largest peacetime evacuation in U.S. history occurred last week because of Florence. More than a million people fled the Atlantic coast as the hurricane roared toward land as a Category 4 storm with sustained winds of over 130 mph. The storm system slowed as it approached the coast and made landfall on Friday, September 14 just south of Wrightsville Beach, North Carolina as a Category 1 hurricane, with sustained winds of 90 mph. Florence has now weakened to a Tropical Depression with sustained winds of 30 mph, but the city of Wilmington has been cut off by flood waters, and North Carolina Governor Roy Cooper is warning that people cannot yet let down their guard. “Flood waters are raging across our state and the risk to life is rising with the angry waters,” Governor Cooper said. Aircraft from the North Carolina Army National Guard flew over Lenoir County Saturday morning in a search-and-rescue mission as floodwaters continued to rise. An informal volunteer group known as the United Cajun Navy, went through the flooded streets of Wilmington in small boats, searching for stranded residents. More than 900 water rescues have been reported to date. Over the weekend, nearly 1,000 personnel from North Carolina and other states, the Federal Emergency Management Agency, FEMA, the National Guard and the Coast Guard deployed more than 200 boats and several helicopters to conduct search and rescue operations, mostly in the southeast portion of the state. Officials anticipate rescue operations will continue for several days. But despite these efforts, at least 18 people have died in storm-related incidents and about 740,000 homes and businesses are still without power across North and South Carolina. The Office of North Carolina’s Chief Medical Examiner has described several of the deaths related to Hurricane Florence. A 41-year-old woman and her seven-month-old son died in Wilmington when a tree fell on their home. A 68-year-old man in Lenoir County died when he was electrocuted while plugging in a generator. A 77-year-old man in Lenoir County fell and died due to a cardiac event while outside checking on dogs during the storm on the night of September 13/14. An 81-year-old man in Wayne County fell and struck his head while packing to evacuate. A husband and wife died in a house fire in Cumberland County. Southeast of Gaston, North Carolina on Sunday night, officials failed an attempt to rescue a one-year-old child in a vehicle who was then swept away in floodwaters, the “Charlotte Observer” reported. Additional deaths that have occurred are in the process of being investigated and reported. As of noon Sunday, more than 15,000 people remain in more than 150 shelters across North Carolina. Swansboro, North Carolina has received more than 30 inches of rain; several other places have received more than 20 inches. Florence is causing flash flooding and major river flooding over a “significant portion” of North and South Carolina, said the National Hurricane Center. Flash flooding is a rare designation that means there is a strong likelihood that floods will occur from the coast to the western mountains, even in areas that typically do not experience them. 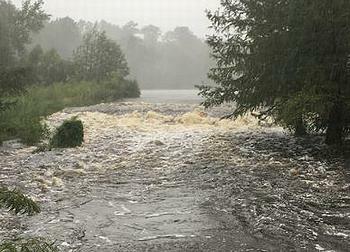 Some rivers, including the Cape Fear, Lumber, Neuse, Yadkin and portions of the Rocky River and South Fork of the Catawba River, are expected to crest at new record levels, breaking those set during Hurricane Matthew. Cape Fear Riverkeeper Kemp Burdette is at Duke Energy’s Sutton Power Plant investigating “very large,” breaches at the Sutton coal ash landfill and a “waterfall” actively pouring out. Duke Energy reported a release at the plant, which is in Wilmington, around 9 p.m. on Saturday. The release occurred when Hurricane Florence flood waters washed coal ash from a landfill near Lake Sutton. Coal ash contains high concentrations of toxins and heavy metals, such as arsenic, chromium, and mercury that are harmful to aquatic life. Although 2,000 cubic yards of material was displaced, enough to fill 150 dump trucks, Duke Energy officials say they do not believe the spill will have an impact on the environment. However, they could not say if any coal ash washed into Sutton Lake, a popular spot for fishing and boating, or the Cape Fear River. 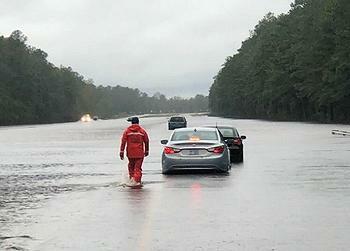 In South Carolina, there have been six confirmed storm-related fatalities. Many South Carolina towns have been forced to evacuate residents from their homes. There are 63 shelters open with roughly 4,000 people sheltering there. About 61,000 South Carolina customers are without power. The highest rainfall total so far is 13.3 inches in Marion County, South Carolina; totals are expected to go higher as rainfall continues across much of the state. As Florence moved further inland through the weekend, flash flood watches were posted in Virginia and southern West Virginia. The National Weather Service has issued a watch through Monday evening for several West Virginia counties. Florence is expected to produce “heavy and excessive rainfall” over the next couple of days, warns the National Hurricane Center. Portions of the Carolinas, Mid-Atlantic States, and Southern New England are expected to receive an additional two to five inches of rain, with isolated maximum amounts of eight inches possible.